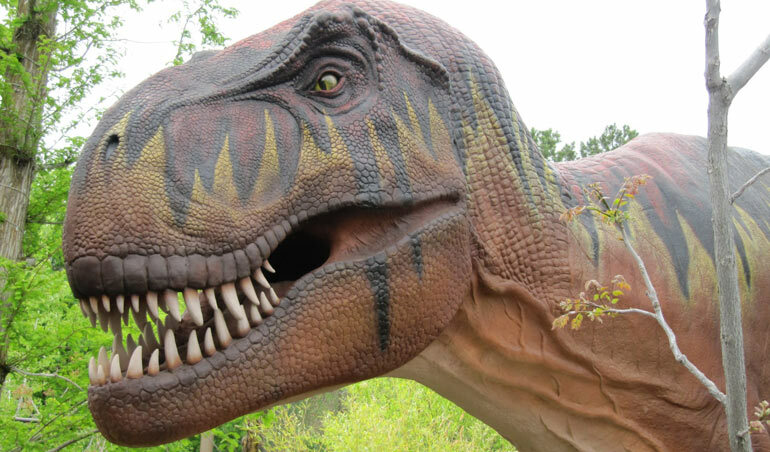 Massachusetts has a new candidate for the Governor’s Mansion. The Sentinel Enterprise reported on Monday that Saturn Partners founding partner Jeffrey McCormick has filed papers to run for government as an independent candidate. 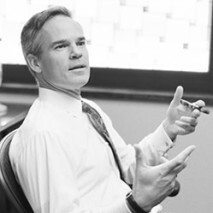 McCormick founded venture capital firm Saturn Partners in 1994 to support early stage growth companies. Their portfolio boasts 35 companies that are still active. Crunchbase reports that the firm’s latest startup investment was Oregon-based Chirpify, a company that facilitates financial transactions via Twitter. Saturn participated in Chirpify’s $6 million dollar series A raise back in July. McCormick’s firm has a reputation of being hands-on in a good way. According to many online sources, including some of the companies that they’ve supported, Saturn lends their expertise in developing companies in a strategic partnership tied to their investment. As for the governor’s race, politics is no stranger to startups. Techstars co-founder Jared Polis is a congressman from Boulder who uses his background in startups and investment to help champion legislation that will spur the economy through startups and small businesses. In fact, McCormick isn’t the only candidate with ties to venture capital. The only Republican candidate at the moment, Charlie Baker, is part of the venture capital firm General Catalyst. On the Democratic side McCormick is facing off against Attorney General Martha Coakley, Treasurer Steven Grossman, former Obama administration Medicare and Medicaid chief Donald Berwick, biotechnology executive Joseph Avellone, former state and federal homeland security advisor Juliette Kayyem and Sen. Daniel Wolf. 1. Design is color. And by color, I mean primary colors, everywhere. 2. Comic sans is so hot right now. 3. Design for conversion, not for aesthetic. So long as it adheres to point #1. 4. When your design induces seizures, you know its good. 5. Designers & startups are like Dolce & Gabbana. Put them together + its magic! 500 Startups is at it again with one of their awesome one day conferences for creatives, startups, and innovators. This time the focus is measurable design. 500 Startup’s Warm Gun conference takes place November 22nd, and you’ll get to enjoy intoxicating amounts of design knowledge from some of the best speakers in the world. You’ve heard of Tryptophan right? That’s what makes you sleep the day away after Thanksgiving dinner. Well at this 500 startups conference, you’ll experience 500-o-phan, a chemical overdose of 500 awesomeness which will leave you napping the following day. Hence, the reason it’s only a one day conference. In true 500 Startups fashion they’ve left the pikers on the side and promise only the hottest “gun slingers” and “hot shots”. You won’t find any posers, just people that know what they’re talking about in regards to design. Here’s the lineup so far. 500 Startups is looking for startups that use design to dominate – consumer, b2b, they want it all. Are you transforming something mundane or necessary into beauty so stunning that unicorns weep? Are you using design to inform, inspire, and delight your users while watching your conversion multiply? Are you making everyone’s day better, one UX at a time? Apply for the Double Rainbow Double Unicorn Startup Design Award for a chance to rock the mic & score a 25k investment from 500 Startups. Warm Gun is November 22nd at Hotel Kabuki 1625 Post Street in San Francisco. To many the event space is an extremely crowded one for new startups. It seems everyone and their grandmother wants to challenge the stranglehold that LiveNation/Ticketmaster has on the event industry. Others feel that they are safe battling the likes of Eventbrite and TicketLeap, and then there are the dime a dozen startups aggregating events in your local area. Well when we heard Kansas City startup Local Ruckus was pivoting to something new in the event space we were intrigued. Basically the problem is that event repository websites are everywhere with none really having that big a piece of the pie. That problem stems from the content. Typically these event sites have a sentence or two about the event leaving potential attendees wondering what the event is really about. Without a more indepth look at the event itself, event organizers are leaving would be patrons on the table, or at least still at home. Adam Arredondo and Matthew Marcus set out to change the way events are marketed and promoted by putting an emphasis on the content and content distribution. Here at nibletz we must get 25 emails a day from entepreneurs and event organizers that ask us to publish their event. Well it’s hard to write five sentences much less 300 words on an event when all we get is the name of the event, date, time and if we’re lucky, cost. So unless we want to go digging through the internet to find the relevant information and build a story we have to pass on it, and it may have been an amazing event. In it’s previous life Local Ruckus was trying to do what many local event sites are doing. While it may not sound like it, Hoopla.io is offering a new, and definitely refreshing approach to local events on a national scale. Local Ruckus had hit a wall that other startups like Louisville’s Impulcity and Nashville’s Wannado have hit. That all changed. “We had been working on our original startup Local Ruckus for a couple years now, and it hit us that Ruckus didn’t have the scalability or force of disruption needed to spread across the country like we had planned. 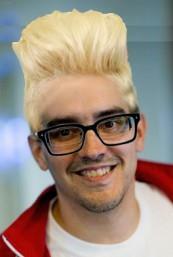 With that epiphany, we knew we needed to change our direction, and change it fast. Hence, Hoopla.io was conceived and born in the span of two months. With Local Ruckus, our passion to help local businesses better promote their events, and consumers more easily discover local events, was always simmering on the back burner of our minds. Hoopla.io was created when our goals and mission really started to boil. And everyone knows to take action when things start to boil.” Marcus said in an interview. Hoopla.io has already received significant validation. They’ve already partnered with Kansas City corporate giant Sprint. They’ve also acquired over $100,000 in non-dilution capital, been named “Best Young Company to Work For” by Turnstone, and they’ve also been accepted into the Digital Sandbox program. Hoopla.io is also preparing to pitch in the semi-finals of the Miller Lite Tap The Future startup contest. The contest pits startups against each other in regional pitch offs judged by ABC Shark Tank Shark, Daymond John. Miller Lite held their first semi-finals in Phoenix Arizona on October 15th. The remaining pitch offs include Atlanta, October 22nd, Dallas Texas, October 30th, Philadelphia , November 1st and Chicago November 5th. Hoopla is pitching at the Dallas event. Find out more about Hoopla here. Intuit, the small business leader in financial management solutions, is holding a pretty big contest for small businesses and technology startups. The contest, which Intuit calls the Intuit Small Business Big Game, kicked off in August when all those interested in entering had to inspire the folks at Intuit and everyday people across the globe. That round narrowed nearly 100,000 entries down to just 10,000. The remaining 10,000 companies are using their networks, social networks, friends, and families for an upvoting process. Those 10,000 companies are being dwindled down to just 20 which will be revealed on Monday, October 28th. The next step in the Small Business Big Game Challenge will have Intuit’s 8500 employees and then a judging panel, narrow those 20 companies down to just four. In November Intuit will reopen voting globally for the world to vote on the final four contestants in the Small Business Big Game. The company with the most votes will be chosen as the winner and receive a professionally produced television commercial to air on the national telecast of the Super Bowl in February. The Super Bowl commercial will put the winner in front of over 100 million viewers, many who actually watch the game for the commercials. Last year’s Super Bowl fell just shy of the record for the most watched television program in history and was the third highest rated Super Bowl of all time. 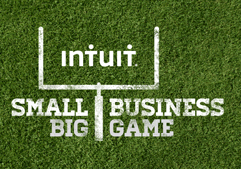 You can stay up to date with Intuit’s Small Business Big Game here. That’s not the only big thing for startups in February check this out. A basketball injury led three Georgia Tech students to disrupt a 5,000 year old device. Partha Unnava spent a summer on crutches after he broke his ankle playing basketball. While being unable to enjoy the summer because of his bum foot, he also experienced serious under arm discomfort, a pain he found that many who have needed to use crutches also experience. So like anyone with a stroke of entrepreneurship in their blood, Unnava set out to re-invent crutches. Unnava turned to fellow biomedical engineering students Andrew Varghese and Frankie Swindell. Better Walk set out to design a more effective crutch that removes force from a crutch user’s underarm area and reduces the amount of direct force through a user’s wrist. After the three got together they applied to the Memphis based ZeroTo510 accelerator that specializes in medical devices. In the previous year ZeroTo510 focused a lot on more technological medical devices. This year’s cohort took on not only BetterWalk, but ambulatory assistance device Mobilizer and a new light that allows surgeons better visibility. Upon getting accepted into the accelerator, Better Walk received $50,000 in seed money. 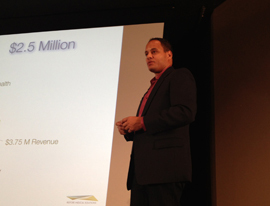 After wowing the crowd at the accelerator’s demo day this past August, Better Walk secured another $100,000 in funding. Unlike all of the startups in the previous year ZeroTo510 accelerator, Better Walk went back home to Atlanta to continue working on their product. “In Atlanta, due to the city being larger, the entrepreneurship community is simply larger. Because there is a larger community, there are more people working to promote entrepreneurship such as David Cummings, who, after selling Pardot, created the Atlanta Technology Village, a building filled with startups that creates a collaborative community for growth and learning. ” Unnava told Nibletz in an interview. “Additionally, Georgia Tech’s biomedical engineering department (which our founding team is a part of) has begun a push to develop its entrepreneurship path with the new chair Ravi Bellamkonda who is helping to provide additional avenues for students interested in entrepreneurship other than the existing Flashpoint program and Venture Lab incubator,” he continued. While Better Walk chose Atlanta’s thriving startup scene to continue to build, another startup from Atlanta chose the opposite path and has been very successful. Atlanta entrepreneur’s Ryan Ramkhelawan and Shawn Flynn started looking for programs and entrepreneurial communities outside of the Atlanta area in late 2011. Without direct ties to Georgia Tech, both gentlemen felt that their startup, Restore Medical, may have better luck in a new area. The company, which has developed a system to faster, more thoroughly and more efficiently sterilize surgical instruments, was attracted to the growth in the medical device sector across Tennessee and specifically in Memphis. When the inaugural cohort to ZeroTo510 was announced the two quickly applied and were accepted. During the 2012 Zeroto510 demo day, Flynn revealed that they already had a $3.75M purchase order. Just months later the company announced a $2.5 million dollar seed round from Memphis based investors. They also became the first startup out of the Zeroto510 accelerator to receive their 510 (k) status, which is a fast track to FDA approval for which ZeroTo510 has it’s name. Restore Medical just opened a manufacturing and distribution facility in Memphis and they already have orders. “The Memphis community has truly accelerated Restore to where it is today. Zeroto510 was the first accelerator of its kind in country and it takes real commitment to make a program like it successful. Job creation is heavy lifting but all the elements exist here in Memphis to develop a self sustained Eco system that will turn the economic development engine. Restore is glad to be here and is committed to doing its part in shaping a positive economic future,” Flynn told us. Find out more about Restore Medical here, Better Walk here and Zeroto510 here. October is a big month for UpGlobal, the new entity created when Startup America and Startup Weekend merged back in May. Next week UpGlobal will hold its first regional Champions Summit under the new umbrella. 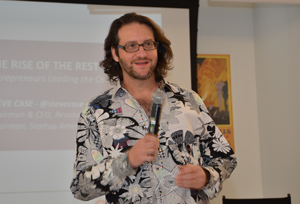 Since its formation, Startup America held quarterly summits for their regional champions. Now, after taking the summer quarter off, the two days of best practices, town halls, and networking continue. This time around they will incorporate Startup Digest curators and Startup Weekend leaders when the conference opens next Tuesday in Iowa. Leading up to the big summit, UpGlobal had two major pieces of news that will help further their efforts to empower entrepreneurs and their communities around the world. The first is a partnership with the US State Department, formally announced by President Barack Obama in a videotaped address he made to the attendees of the Global Entrepreneurship Summit in Kuala Lumpur, Malaysia. ” In partnership with Up Global, we’ll help support 500,000 new entrepreneurs and their startups around the world,” President Obama told the audience. UpGlobal oversees these four key initiatives to help grow entrepreneurs across the globe. Startup Weekend: A 54-hour event that educates aspiring entrepreneurs by immersing them in the process of moving an idea to market. NEXT: A five-week course for early-stage startup founders to better understand their product or service, become ideal candidates for accelerators or incubators, and fully integrate proven entrepreneurial methodologies. Startup Digest: The world’s largest curated source of information, news, and resources for anyone interested in entrepreneurship. All content is tailored to reflect the local community, and subscribers receive a personalized digest each week. Connecting: UP Global and the State Department will work together to help establish new UP Global chapters in 500 new countries and augment existing resources available to aspiring entrepreneurs. Leveraging Networks: The State Department will draw on its extensive networks in target countries to bring in local business leaders and prominent American entrepreneurs to reinforce UP Global’s programs and events. Drawing attention to the cause: UP Global and the State Department will coordinate to get information out about the entrepreneurship resources available through UP Global, including, when appropriate, through social media channels and outreach to local press. The next big news for Seattle based Up Global was that Google, who has been partnering with Startup Weekend since last year through their Google For Entrepreneurs initiative, has doubled down and taken over as lead sponsor for Startup Weekend. Google has replaced the Kauffman Foundation as the lead sponsor of the organization. I was one of the first people to dismiss the hoopla surrounding Mailbox, the wildly popular startup that provided what appeared to be a good alternative to iOS mail. They were able to get millions of people excited about the app by creating an exclusive sign up / invite list when you downloaded the app. When it was launch day you got to check your phone every few minutes to see how far you were away from getting one of the most overly hyped apps of all time. Early on I thought I was the only person on earth who thought Mailbox sucked. I was quickly vindicated by fellow journalist Nicholas Carlson at Business Insider, who saw the same shortcomings of the Mailbox app for people who actually get and rely on email. 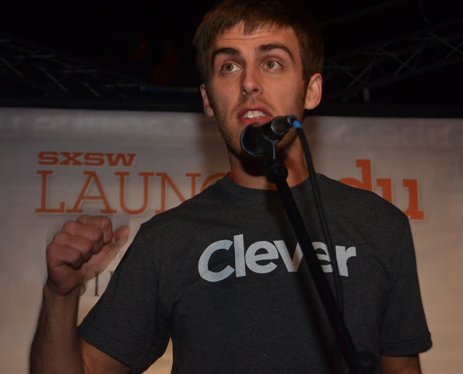 Luckily for me, shortly after the Mailbox dust settled (and they were acquired by DropBox), I met Andrew Eye at SXSW. Eye was showing off his new app, at the time called TaskBox. Now Taskbox was made for people that get a constant flow of email for work. You can see some of the reasons I love Taskbox, here. After spending some time with Eye at SXSW, we were one of the first media outlets that he called when they announced they had merged with Boxer, the latest startup created by Xoogler Jason Shellen, founder of Brizzy and his even newer latest thing, The Secret Agency. They quickly combined features and in June relaunched as Boxer. Yesterday they announced that they had raised a $3 million dollar seed round led by Sutter Hill Ventures. In addition to having an excellent feature set, Boxer cites their open integration platform and existing integrations with Box, DropBox, LinkedIn and Facebook as keys to their future. Boxer has assembled a worldclass executive team and advisory board filled with proven entrepreneurs and industry veterans. Originally founded in 2012 by CEO Andrew Eye (former COO Ciphent Inc. 500 #16) and CTO Adam Cianfichi, Boxer added VP of Engineering Ian Ragsdale (former CTO at email startups OtherInbox and Skylist) and VP of Product Timothy Sullivan, (former mobile product lead at Zynga) in 2013. The Austin based startup launched out of the Capital Factory, which is led by Josh Baer, a pioneer in the world of email. Download Boxer for yourself here, and find out why it really just works. Brian Rogers and the folks behind Barcamp Jonesboro have made a pivot, changing the name of Barcamp Jonesboro to IDEA Tech Festival. With that they’ve turned the event in to two days (this time around), featuring a startup pitch contest and a full day of presentations. The IDEA Tech Festival founders plan on growing the festival event after event and hope that in the coming years it will turn into a week long festival including a festival, technology trade show, hackathons and more. They also plan on holding these events twice a year beginning in 2014. As for this year, the first IDEA Tech Festival is about 3 weeks away, on November 8th and 9th. November 8th kicks off IDEA Tech Festival with a startup pitch contest at 6:00pm at the Brick House Grill in Jonesboro. Investors, entrepreneurs, startup leaders and media will all be in attendance to see the best of the best of what Jonesboro’s tech scene has to offer. Up for grabs is a $1000 cash prize, and other prizes. November 9th is dubbed “Tech Talks” and will be held at the ASU Delta Center. The schedule for Saturday’s talks can be found here. The event promises to bring great content for developers, entrepreneurs, freelancers and artists. Tech Talks will be in three different tracks; Creative & Marketing, Development & Technology, and Business & Finance. This is a great step for Jonesboro’s tech and startup scene. Find out more here. Top research firm CB Insights released some very relevant and interesting data last week. The firm has been diving into their VC data to better understand fund performance and syndicate. In what they call one of their “more polarizing” briefs, they revealed that even today Silicon Valley is the most relevant market for venture capital. 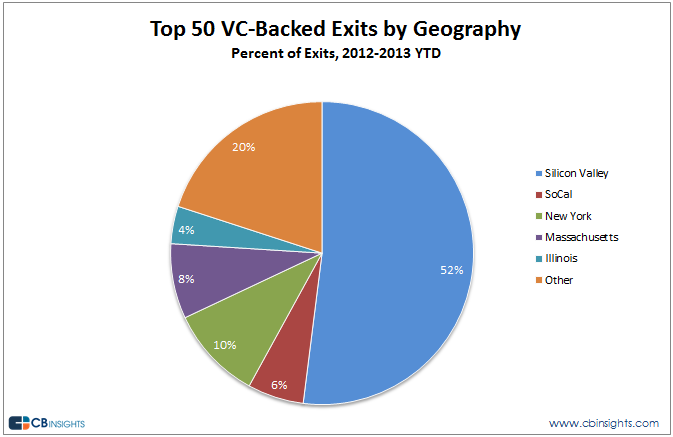 Silicon Valley is still producing the most exits. Their latest data, measuring deal flow across the country, Silicon Valley still represents 52% of VC backed exits, leaving “everywhere else” with an improved, but still less, 48%. When purely looking at the value of exits, Silicon Valley is still far ahead of everywhere else. When CB Insights analyzed the valuation of the top 50 exits in the country Silicon Valley companies accounted for 86% to the top aggregate exit valuations of those top 50 exits. In 2012 Facebook’s IPO accounted for a tremendous chunk of the 86% but once removed Silicon Valley still accounts for 54% of the aggregate exit valuations. New York, Southern California, Massachusetts and Illinois trail behind Silicon Valley. There are even investors who believe that New York is a waste of time. CB Insights reports that at a recent dinner in NY hosted by Silicon Valley firm Lowenstein Sandler one VC said “New York is an irrelevant market for us as a venture capital firm. They went on to say that from the investor’s perspective allocating his firm,s time to New York or any other market outside of Silicon Valley was a waste of time. Late last month AOL founder Steve Case announced that his Revolution Venture Fund had raised $200 million dollars that they were specifically going to use to back companies everywhere else. Case’s big mantra is “Rise of the rest,” and that is exactly what’s going on now. There have always been investors and startups everywhere else. One of the fundamental problems we’ve found since launching Nibletz and the Everywhere Else conferences is that entrepreneurs and investors exist everywhere. The problem lies in the fact that the entrepreneurs believe that it’s best to move to Silicon Valley or in some regards New York City to grow their company. At the same time the investors either don’t know that there are good deals in their own neighborhoods or it’s just flashier to find an investment in a larger city or participate in rounds with Silicon Valley. Events like Big Omaha, Big KC, UpGlobal’s startup summit, and the Everywhere Else Conference Series all unite entrepreneurs from everywhere else to continue developing their own market. The notion that innovation only happens in Silicon Valley is quite ridiculous. Cars were invented in Detroit. Air planes were invented in North Carolina (some may dispute that). The overnight package was invented in Memphis, Tennessee. In the overall landscape of things, everywhere else far outweighs the rest of the country as far as large corporations being founded and continuing to produce.